Casey Dawes writes and quilts on the Clark Fork River in Missoula, Montana where she spends far too much time watching wildlife from her “woman cave.” She shares her peaceful abode with a husband she adores and two cats who think they own the joint. In her previous “lives” she’s been a medical records secretary, stagehand, college professor, junior high teacher on an Indian Reservation, Montessori teacher in Brooklyn, temp in businesses in New York City, a database guru for several fortune 500 companies, business and life coach. She’s lived in New Jersey, Massachusetts, Michigan, Montana, New York City, Pennsylvania and California. With these varied careers, four step-children and two boys of her own, she has plenty to write about! She’s written three non-fiction books. California Sunset was her first romantic fiction book. A passionate believer in the healing power of love, Casey knows that anyone can find the love he or she deserves and wants. Her characters can show you how. She’d love to hear your opinion on any book. Please consider leaving a review on Amazon. Thanks! If you want to be notified about upcoming releases, please go to www.stories-about-love.com and subscribe to the Stories About Love newsletter which comes out about four times a year. 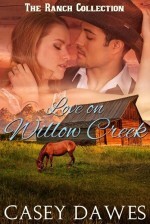 Western romance collection from five of your favorite best-selling authors. Love under the big sky of Montana. After high school, Bridget Lawson fled Willow Creek for the fame of the rodeo circuit. Eight years later she returns, wounded in soul, body and heart, only to encounter the man who dumped her.